I finally have something special to post, my daughters 6th birthday party! She originally wanted a Veterinarian themed birthday but I couldn't find enough good ideas on Pinterest that wowed me. Instead I just convinced her that people could just bring items for donation to the Edmonton SPCA in lieu of gifts so that got her excited. I wasn't actually going to make it a big deal this year but that changed a week prior to her birthday when I got the idea in my head that I was going to do a Peter Pan theme. 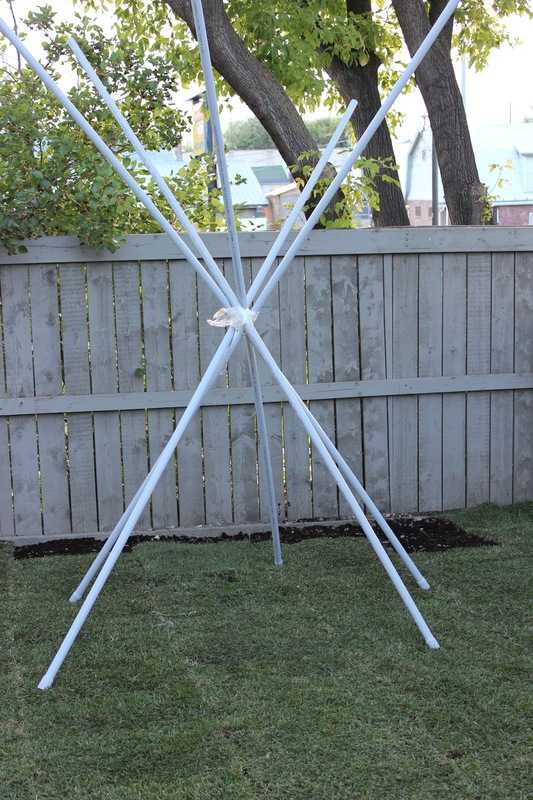 So BOOM, I told my husband that I needed to build a teepee and do games in the back yard and that we needed to finally get the grass that C has been asking for since spring. We sent the girls off to their grandparents for a couple of days since I wanted this whole theme to be a surprise. 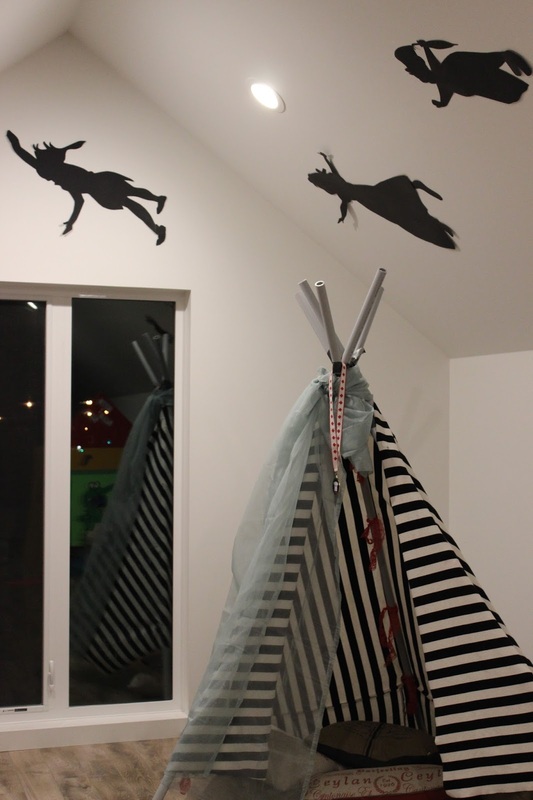 A long time ago I saw a similar black and white tent at the Land of Nod and was reintroduced to the teepee while searching through Pinterest for ideas. So as usual I went shopping at my moms house for fabric and supplies (I also discovered that she has a room full of fabric and ribbon). 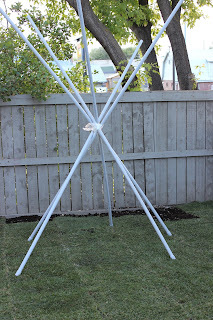 The tent was originally set up in the back yard with rope but it wouldn't stay together so we duct taped it instead. 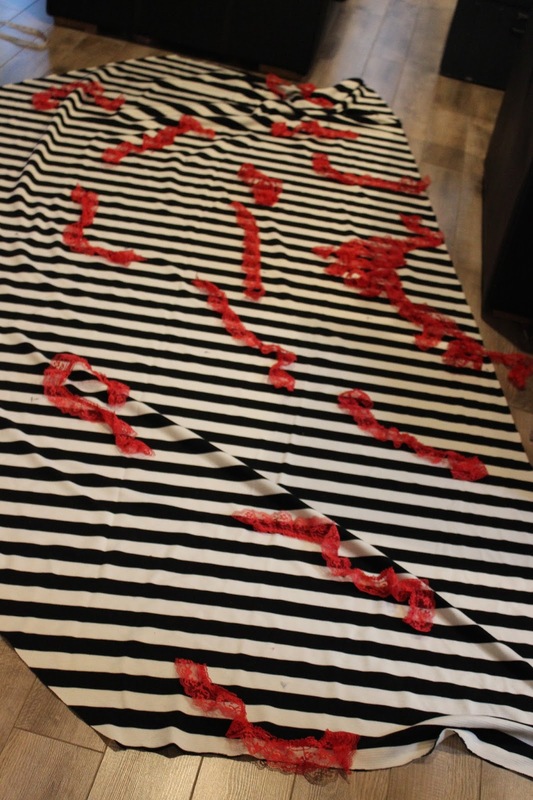 I wrapped the fabric around the pvc pipes and then marked and sewed where the ribbon would tie and hold the fabric and tent together. I was only able to find green felt at Michael's for the Peter Pan hats despite looking at Dollar Tree, Dollarama, and Walmart. I bought a regular sheet and folded and cut diagonally. To make the brim I just turned up the back edge and sewed a seam closely along the bottom along with a feather. Other than the tent, I spent the most time on these hats looking for fabric and sewing them and neither boys that came to the party wanted to wear them! Go figure. Birthday flags are made from the left over poster board that I made the shadow Peter Pan characters out of. Black letters are from Dollar Tree that I flipped around to use the white side, some are cut as well since not all letters can be flipped to look the same. Probably 12am at this point of decorating. All of the characters were drawn free hand on poster board and then taped onto the ceiling. It would have been easier to have them projected somehow to trace but I couldn't figure out how. We got bow and arrows (not shown) from Dollarama to shoot through Tick Tock's mouth as a fun game. I drew him free hand on poster board, then cut and glued his stomach and eyes on. Unfortunately the mermaid lagoon never made it outside for water. We decided to saw off the tops of the pvc pipes around 1am so that they wouldn't wreck the ceiling. 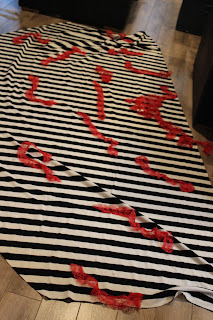 The "Neverland" banner is made from and old Kung Fu sash that my husband wasn't too happy about me drawing on. 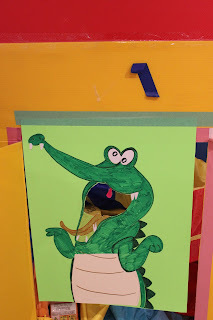 This was a simple craft for the kids. I bought glittery insect stickers that the kids just stuck straight onto the headdress and it was backed with the exact same shaped sticker. 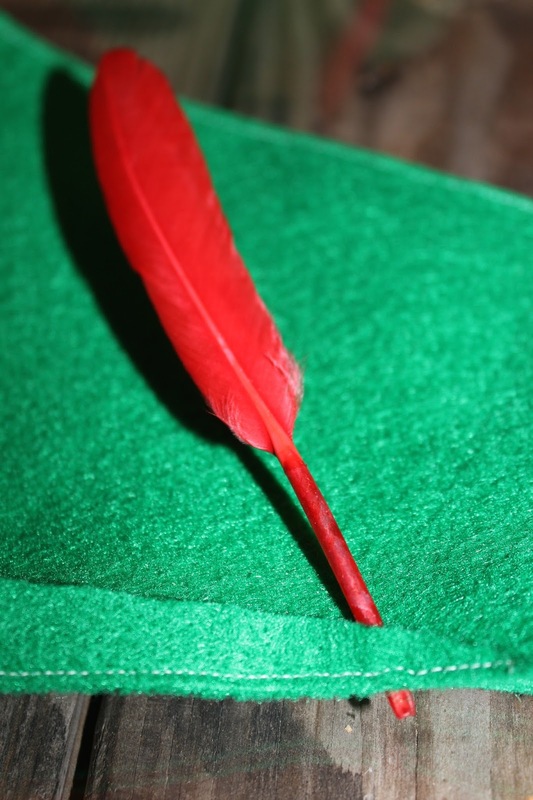 Feathers were held on the same way. I got some colourful scotch tape to hold things as well but the stickers worked the best. These treasure boxes for the kids to paint and fill occupied them for quite a while. We used clear glitter paint and jewel stickers. They wrote their names on them and then I allowed them to have handfuls of jewels and chocolate coins to fill their boxes up with. 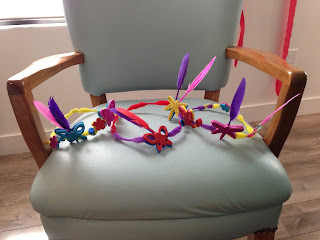 The fairy wings are from Dollar Tree for $1.25 each. Treasure boxes, glitter paint, pipe cleaners, feathers, paint brushes, jewels, chocolate coins, jewel stickers are all from Dollarama. My daughter loves watermelon so this tiered cake was perfect. Fairies are from a set at the Disney Store. These mushrooms were one of a few sweet things for the party since my daughter doesn't care too much for candy. During the party while her friends were tossing the apple tops she ate her tops and dumped her marshmallows in the garbage! 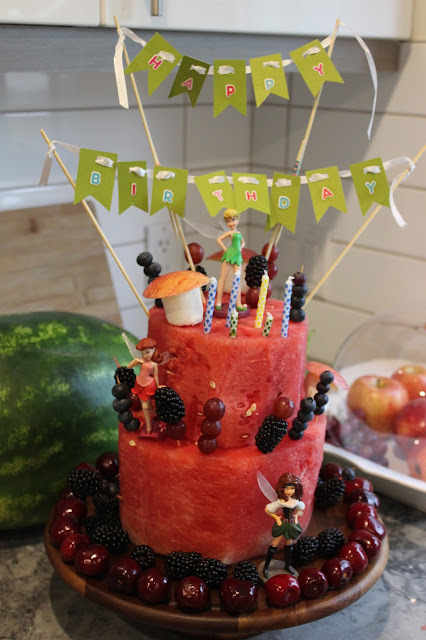 Water melon tiered cake and apple/marshmallow mushrooms are ideas via Pinterest. I didn't need to hold the 'mushrooms' together with anything as eventually the apples just stuck to them. The kids filled up their tiny glass jars with "Pixie Dust". NEVER AGAIN, reports of broken glass and dust on parents beds ensued...my floor is still sticky! 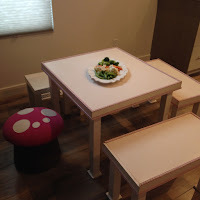 Does anyone recognize these table and chairs? Once upon a time they used to be taller! All in all it was worth it because three times that day C said that her party was 'the best ever'!